With an overwhelming presence of water in the form of canals and backwaters, the district of Alappuzha has a distinct lifestyle owing to the presence of these water bodies. 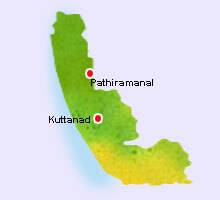 The region has in store, some of the picturesque natural settings in Kerala. Interspersed with vast stretches of paddy fields, avenues of coconut trees, islets and villages, Alappuzha is also famous for coir making and coir-based industries. Historically, Alappuzha was once an important trading center and was popular among foreign traders as the ‘Venice of the East.’ Renowned for its any boat races, Alappuzha also has beautiful stretched fishing villages and is also one of the few places in the world, where farming is done below sea level.